Baltimore Harbor Light is a cylindrical white two-story brick lighthouse built on a caisson foundation. Its construction began in 1904 at the mouth of the Magothy River and the entrance to the Baltimore Harbor. This was the last lighthouse to be built on the Chesapeake Bay. The original request for a lighthouse was made in 1890. It was twelve years before Congress agreed to fund the construction. The construction took four years to complete due to engineering problems and bad weather. The caisson was towed to the site and sunk over the shoal. In October 1904 a violent storm pushed the caisson over into the bay. The project was abandoned and the construction did not resume until 1907. The completed lighthouse contained living quarters for two keepers. The fifth order Fresnel lens was installed in 1908. 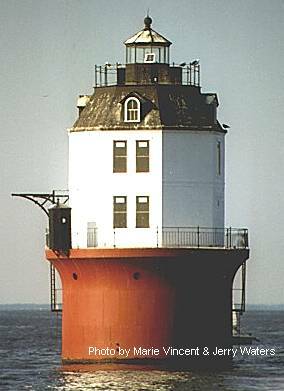 In 1964 the Baltimore Light became the first and only lighthouse powered by nuclear energy. Two years later the reactor was removed and a conventional electric generator was installed. Today the lighthouse is operated by solar power. It is accessible only by boat.